Ralph Honda, located in Rochester N.Y., was expanding and renovating its existing building. The expansion included adding a new showroom, adding new service bays, adding a new car wash and renovating the parking lot. As this was a redevelopment project with an increase in impervious area, the New York State Department of Environmental Conservation (NYSDEC) water quality regulations had to be met. This included meeting a removal efficiency of 80% total suspended solids and 40% phosphorous, as well as providing for runoff volume reduction. The local Contech storm water consultant worked with LaDieu Consulting to explore various solutions in order to accommodate the water quality requirements. There was limited space as well as high groundwater on the site, which did not allow for any infiltration, so a manufactured system was required. 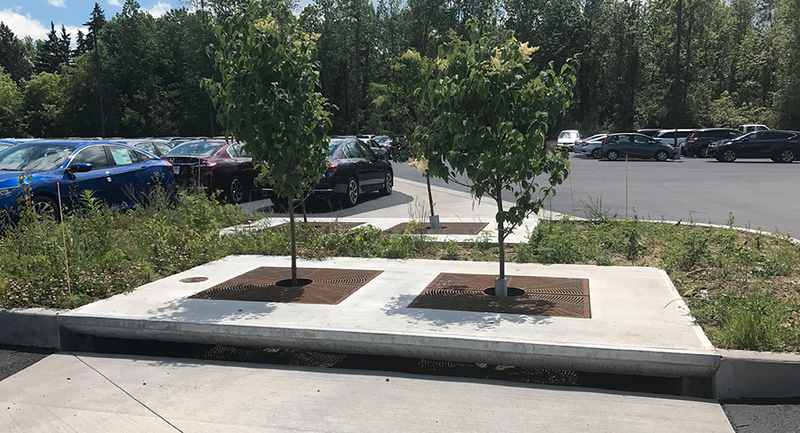 The Filterra bioretention solution was chosen, as it could accommodate both the runoff reduction and water quality treatment requirements in one system. Filterra is similar to bioretention in its function and application, but has been optimized for high volume and flow treatment and high pollutant removal. Its small footprint allows it to be used on highly developed sites such as landscaped areas, parking lots and streetscapes. Three 13-by-7-in. standard offline Filterra units were used on the project. The Filterra standard offline configuration is the most economical and simplest Filterra configuration. It utilizes a downstream catch basin or curb inlet for bypass flows, allowing for the shallowest profile and most flexible design of any of the Filterra configurations. Contech provided the system activation and one year of maintenance to ensure proper system functionality.